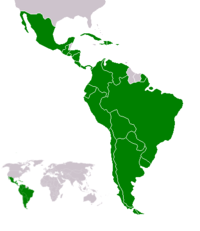 Latin America (Portuguese/Spanish: América Latina) is the region of the Americas where Romance languages — those derived from Latin — are officially or primarily spoken. 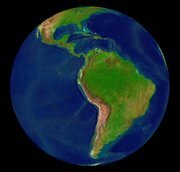 Latin America is distinct from Anglo-America, a region of the Americas where English, a Germanic language, predominates. From a strict cultural and linguistic perspective, it would include all countries and territories where Romance languages — Spanish, Portuguese, French, and their creoles — are spoken. 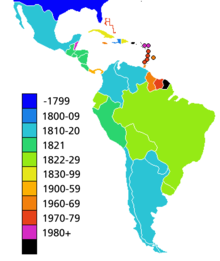 The most common view is that Latin America includes territories in the Americas where Spanish or Portuguese prevail: Mexico and most of Central America, South America, and (per land area and population) the Caribbean. The acronym "LACRO" refers to this view. The English-speaking American countries are not considered to be part of Latin America. Territories where other Romance languages such as French (e.g., Quebec in Canada) or Kreyol (e.g. Haiti, Martinique and Guadeloupe) predominate are frequently not considered to be part of Latin America from this perspective, despite the French origins of the concept. The former Dutch colonies Suriname, Netherlands Antilles and Aruba are not considerend parts of Latin America, even though in the latter two, the predominantly Iberian-influenced language Papiamentu is spoken by the majority of the population. 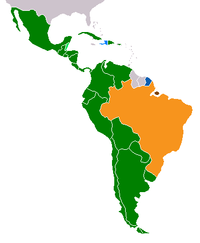 Sometimes, particularly in the United States, the term "Latin America" is used to refer to all of America south of the U.S., including countries such as Belize, Trinidad and Tobago, Guyana, Jamaica, Barbados and Suriname where non-Romance languages prevail. Conversely, it is often used in Brazil to designate the Spanish-speaking countries within this area, which are often known as Hispanic America. Geopolitically, Latin America is divided into 20 independent countries and several dependent territories. Spanish is predominant and an official language in most Latin American countries, with the exception of Brazil where Portuguese prevails. Originally a political term, Amerique Latine was coined by French emperor Napoleon III, who cited Amerique Latine and Indochine as goals for expansion during his reign. While the term helped him stake a claim to those territories, it eventually came to embody those parts of the Americas that speak Romance languages initially brought by settlers from Spain, Portugal and, in a minor extent, France in the 15th and 16th centuries. An alternate etymology points to Michel Chevalier, who mentioned the term in 1836. In the United States, the term was not used until the 1890s, and did not become a common descriptor of the region until early in the twentieth century. Before then, Spanish America was more commonly used. The term Latin America has come to represent an expression equivalent to Latin Europe and implies a sense of supranationality greater than those implied by notions of statehood or nationhood. This supranational identity is expressed through common initiatives and organizations, like the South American Community of Nations. It is important to observe that the terms Latin American, Latin, Latino, and Hispanic differ from each other. Many people in Latin America do not speak Latin-derived languages, but native ones or languages brought over by immigration. There is also the blend of Latin-derived cultures with indigenous and African ones resulting in a differentiation in relation to the Latin-derived cultures of Europe. Quebec, other French-speaking areas in Canada and the United States like Acadia, Louisiana, Saint-Pierre and Miquelon, and other places north of Mexico are traditionally excluded from the sociopolitical definition of Latin America, despite having significant populations that speak a Latin-derived language, due in part to these territories' not existing as sovereign states or being geographically separated from the rest of Latin America. French Guiana, however, is often included, despite being a dependency of France and not an independent country. As alluded to above, the term Ibero-America is sometimes used to refer to the nations that were formerly colonies of Spain and Portugal, as these two countries are located on the Iberian peninsula. The Organization of Ibero-American States (OEI) takes this definition a step further, by including Spain and Portugal (often termed the Mother Countries of Latin America) among its member states, in addition to their Spanish and Portuguese-speaking former colonies in America. The Americas are thought to have been first inhabited by people crossing the Bering Land Bridge, now the Bering strait, from northeast Asia into Alaska more than 10,000 years ago. Over the course of millennia, people spread to all parts of the continent. By the first millennium AD/CE, South America’s vast rainforests, mountains, plains and coasts were the home of tens of millions of people. 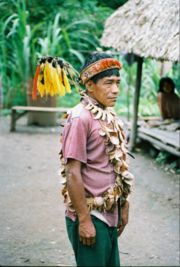 Some groups formed permanent settlements, such as the Chibchas (or "Muiscas" or "Muyscas") and the Tairona groups. The Chibchas of Colombia, the Quechuas of Peru and the Aymaras of Bolivia were the three Indian groups that settled most permanently. The region was home to many indigenous peoples and advanced civilizations, including the Aztecs, Toltecs, Caribs, Tupi, Maya, and Inca. The golden age of the Maya began about 250, with the last two great civilizations, the Aztecs and Incas, emerging into prominence later on in the early 14th century and mid-15th centuries, respectively. With the arrival of the Europeans following Christopher Columbus's voyages, the indigenous elites, such as the Incans and Aztecs, lost power to the Europeans. Hernán Cortés destroyed the Aztec elite's power with the help of local groups who disliked the Aztec elite, and Francisco Pizarro eliminated the Incan rule in Western South America. European powers, most notably Spain and Portugal, colonized the region, which along with the rest of the uncolonized world was divided into areas of Spanish and Portuguese control by the Line of Demarcation in 1493, which gave Spain all areas to the west, and Portugal all areas to the east (the Portuguese lands in America subsequently becoming Brazil). By the end of the 16th century, Europeans occupied large areas of Central and South America, extending all the way into the present southern United States. European culture and government was imposed, with the Roman Catholic Church becoming a major economic and political power, as well as the official religion of the region. Diseases brought by the Europeans, such as smallpox and measles, wiped out a large proportion of the indigenous population, with epidemics of diseases reducing them sharply from their prior populations. Historians cannot determine the number of natives who died due to European diseases, but some put the figures as high as 85% and as low as 20%. Due to the lack of written records, specific numbers are hard to verify. Many of the survivors were forced to work in European plantations and mines. Intermarriage between the indigenous peoples and the European colonists was very common, and, by the end of the colonial period, people of mixed ancestry (mestizos) formed majorities in several colonies. By the end of the 18th century, Spanish and Portuguese power waned as other European powers took their place, notably Britain and France. Resentment grew over the restrictions imposed by the Spanish government, as well as the dominance of native Spaniards (Iberian-born peninsulares) over the major institutions and the majority population, including the Spanish descended Creoles (criollos). Napoleon's invasion of Spain in 1808 marked the turning point, compelling Creole elites to form juntas that advocated independence. Also, the newly independent Haiti, the second oldest nation in the New World after the United States, further fueled the independence movement by inspiring the leaders of the movement, such as Simón Bolívar and José de San Martin, and by providing them with considerable munitions and troops. Fighting soon broke out between the Juntas and the Spanish authorities, with initial Creole victories, such as Father Miguel Hidalgo's in Mexico and Francisco de Miranda's in Venezuela, crushed by Spanish troops. Under the leadership of Simón Bolívar, José de San Martin and other Libertadores, the independence movement regained strength, and by 1825, all of Spanish Latin America, except for Puerto Rico and Cuba, gained independence from Spain. Brazil achieved independence with a constitutional monarchy established in 1822. During the same year in Mexico, a Spanish military officer, Agustín de Iturbide, led conservatives who created a constitutional monarchy, with Iturbide as emperor (shortly followed by a republic). See the Interactive Map of Politics in Latin America. In addition, some might add Belize, the Falkland Islands, Guyana, Trinidad & Tobago, and Suriname to this list, but they are not culturally or linguistically Latin American — although much of Belize's population is. They maintain economic ties with nearby countries, and are grouped by the United Nations in the predominantly Latin American region (South. However, all except Suriname are also the objects of long-standing territorial claims by their Latin American neighbors. The population of Latin America is an amalgam of racial and ethnic groups. The composition varies from country to country; some have a predominance of a racially mixed population, some have a high percentage of people of Amerindian origin, some are dominated by inhabitants of European origin and some populations are primarily of African origin. Most or all Latin American countries have Asian minorities. Latin America has a very diverse population, with many ethnic groups of different ancestries or races, the majority of which are either of European, Amerindian, or African descent, or a mix of any of these. Only in three countries do the Amerindians make up the largest segment of the population: in Guatemala and Bolivia they represent a majority of over 50%, and in Peru they constitute a plurality of just under 50%. In the rest of the Continent, most people with a Native American lineage are admixed with one or more other racial lineages. Since the 16th century a large number of Iberian colonists left for Latin America: the Portuguese to Brazil and the Spaniards to the rest of the region. An intensive race mixing between the Europeans and the Amerindians occurred (mostly in, and after, the 1800s) and their descendants, known as mestizos, make up the majority of the population in several Latin American countries, such as Mexico, Chile, Colombia, Ecuador, El Salvador, Honduras, Nicaragua, Panama, and Venezuela. Starting in the late 16th century, a large number of black African slaves was brought to Latin America, the majority of whom were sent to the Caribbean and Brazil. Nowadays, African descendants make up the majority of the population in most Caribbean countries. Many of the African slaves in Latin America mixed with the Europeans, and their descendants, known as Mulattos, make up the majority of the population in some countries such as the Dominican Republic and Cuba, and a large proportion of the populations of Brazil, Colombia, Venezuela, and Belize. Mixing between Africans and Amerindians also occurred, and their descendants are known as Zambos, found primarily in Venezuela and Colombia. Many Latin American countries also have a substantial tri-racial population, their ancestry being a mix of European, Amerindian, and African, most notably in Dominican Republic, Puerto Rico, Venezuela, and Brazil. In this same period, many immigrants came from the Middle-East and Asia, including Indians, Lebanese, Syrians, and, more recently, Koreans, Chinese and Japanese (mainly to Brazil). In the late 19th century, a small wave of Americans, mostly from the former Confederate States or the Southern U.S., settled in Brazil and fewer across Latin America. This diversity of Latin America has profoundly influenced religion, music, and politics, and gave rise to a weak feeling of identity. This opaque cultural heritage and identity is called Latin or Latino in United States' English. Outside of the U.S., and in many languages (especially romance ones) " Latino" just means "Latin", referring to cultures and peoples that can trace their heritage back to the ancient Roman Empire. Latin American is the proper term. These figures include 19 of the 20 Latin American nations. Venezuela is not included as it does not include race on its census. Total Population 522.8 million. Racial groups: 174 million White (33.3% of the total population), 133.8 million Mestizo (25.6%), 90.3 million Mulatto (17.3%), 60.8 million Amerindian or Native Peoples (11.6%), 31.5 million White/Mestizo (6%; a few countries count Whites and Mestizos together), 24.8 million Black (4.7%), 1.4 million Asian (0.3%; this figure may be much lower than the actual one), 6.2 million Other and Unknown (1.2%). [Note: Venezuela's population is 26,749,000. Applying to this the country's 1998 race ratios (mestizo 67%, white 21%, black 10%, Amerindian 2% ( )) yields, for the entire region: Population 549,549,000; White 32.7%, Mestizo 27.6%, Mulatto 16.4%, Amerindian or Native Peoples 11.2%, White/Mestizo 5.7%, Black 5%, Asian 0.3%, Other and Unknown 1.1%]. As these numbers show, although almost every Latin American country has a majority population, that is not the case for the region as a whole. Another fact they show is that more than 80% of Latin Americans range from having a significant amount of European admixture to being of fully European origin. Spanish is the predominant language in the majority of the countries. Portuguese is spoken primarily in Brazil, where it is both the official and the national language. French is also spoken in smaller countries, in the Caribbean, and in French Guiana. Dutch is the official language on various Caribbean islands and in Suriname on the continent; however, as Dutch is a Germanic language, these territories can not be considered part of Latin America. Several nations, especially in the Caribbean, have their own Creole languages, derived from European languages and various African tongues. Native American languages are spoken in many Latin American nations, mainly Peru, Guatemala, Bolivia, Paraguay, and to a lesser deegree in Mexico and Ecuador. Note that the lesser degree of indigenous speakers in Mexico is proportional to that country's population. In real numbers, however, Mexico harbours the largest population of indigenous speaker of any country in the Americas, surpassing Amerindian majority countries of Guatemala, Bolivia and the Amerindian plurality country of Peru. The population of speakers of indigenous languages in other countries is tiny or non-existent. In Peru, Quechua holds official language status, alongside Spanish and any other indigenous language in the areas where they predominate. In Bolivia, Aymara, Quechua and Guaraní hold official status alongside Spanish. Guarani is, along with Spanish, the official language of Paraguay, and is spoken by a majority of the population who are for the most part mestizos bilingual in Spanish. In Ecuador, while holding no official status, Quichua is a recognized language of the indigenous people under the country's constitution, however, it is only spoken by a few groups in the Sierra region of the country. Colombia, while having fewer than 1% of its population as speakers of indigenous languages, recognizes all indigenous languages spoken within its territory as official. Nahuatl is only one of the 62 native languages spoken by indigenous people in Mexico, which are officially recognised by the government as "national languages", along with Spanish. European languages, other than Spanish and Portuguese, that are spoken include; Italian in Brazil, Argentina, Uruguay and Venezuela; German in southern Brazil, Argentina, and two German-speaking villages, one in southern Chile and another in northern Venezuela; Welsh in southern Argentina. The primary religion throughout Latin America is Roman Catholicism. Latin America, particularly Brazil, is active in developing the quasi-socialist Roman Catholic movement known as Liberation Theology. Practitioners of the Protestant, Pentecostal, Evangelical, Mormon, Buddhist, Jewish, Islamic, Hindu, Bahá'í, and indigenous denominations and religions exist. Various Afro-Latin American traditions, such as Santería, and Macumba, a tribal- voodoo religion are also practiced. Evangelicalism in particular is increasing in popularity. Below is a table showing the Gross domestic product (GDP) per capita at purchasing power parity (PPP) prices and the GDP (PPP) of each Latin American country. This can be used to roughly gauge the standards of living in the region. Data compiled from the year 2005. The Latin American G7 is composed of Argentina, Brazil, Chile, Colombia, Mexico, Peru and Venezuela. Income equality data --according to Gini index (the higher the number, the higher the inequality) -- is based on List of countries by income equality, survey year of data varies. African cultures, who were part of a long history of New World slavery. Peoples of African descent have influenced the ethno-scapes of Latin America and the Caribbean. This is manifest in the Caribbean through dances such as, the rumba, the mambo, the samba the bomba, the plena, the candombe, the cumbia, the merengue, and the salsa to mention but a few. The development of Latin American painting stemmed originally from the styles brought along by Spanish, Portuguese and French Baroque Painters, which in turn were following the trends of the Italian Masters. This Eurocentrism of the Arts, in general, started to fade in the early 20th century, as Latin-Americans began to acknowledge the uniqueness of their condition and started to follow their own path. From the early 20th century, the art of Latin America was greatly inspired by the Constructivist Movement. The Constructivist Movement was founded in Russia around 1913 by Vladimir Tatlin. The Movement quickly spread from Russia to Europe and then into Latin America. Joaquin Torres Garcia and Manuel Rendón have been credited with bringing the Constructivist Movement into Latin America from Europe. Another important artistic movement generated in Latin America is Mexico's Muralismo represented by the world famous painters Diego Rivera, David Alfaro Siqueiros, José Clemente Orozco and Rufino Tamayo. Some of the most impressive Muralista works can be found in Mexico, New York, San Francisco, Los Angeles and Philadelphia. Mexican painter Frida Kahlo remains by far the most known and famous Latin American artist. She painted about her own life and the Mexican culture in a style combining Realism, Symbolism and Surrealism. Kahlo's work holds the highest selling price of all Latin American paintings. Latin American literature gained its own identity, evolving from the strong European and, at a later stage, Anglo-American influences, and is very recognisable internationally, including renowned Nobel Prize winners such as the Colombian Gabriel García Márquez ( One Hundred Years of Solitude), Mexican Octavio Paz ( The Labyrinth of Solitude), Chileans Gabriela Mistral and Pablo Neruda. The Argentine Jorge Luis Borges is an influential figure of Latin-American letters. One of the main characteristics of Latin American music is its diversity, from the lively rhythms of Central America and the Caribbean to the more austere sounds of southern South America. Another feature of Latin American music is its original blending of the variety of styles that arrived in The Americas and became influential, from the early Spanish and European Baroque to the different beats of the African rhythms. Hispano-Caribbean music, such as salsa, merengue, bachata, etc. from Cuba, Panama, Puerto Rico and the Dominican Republic, are styles of music that have been strongly influenced by African rhythms and melodies. Other main musical genres of Latin American include the Argentine and Uruguayan tango, the Colombian cumbia and vallenato, Mexican ranchera, Uruguayan Candombe, the Central American (Garifuna) Punta, the French Antillean Zouk, the Antillean Soca and Calypso, and the various styles of music from Pre-Columbian traditions that are widespread in the Andean region. In Brazil, samba, North-American jazz, European classical music and choro combined into the bossa nova music. Recently the Haitian kompa has become increasingly popular. The classical composer Heitor Villa-Lobos (1887-1959) worked on the recording of native musical traditions within his homeland of Brazil. The traditions of his homeland heavily influenced his classical works. Also notable is the recent work of the Cuban Leo Brouwer and guitar work of the Venezuelan Antonio Lauro and the Paraguayan Agustín Barrios. Arguably, the main contribution to music entered through folklore, where the true soul of the Latin American and Caribbean countries is expressed. Musicians such as Atahualpa Yupanqui, Violeta Parra, Victor Jara, Mercedes Sosa, Jorge Negrete, Caetano Veloso, and others gave magnificent examples of the heights that this soul can reach. More recently, Reggaeton, a blend of the Jamaican dancehall rhythm Dem Bow with Rap music and Hispano-Caribbean music, which originated in Panama, Cuba, Puerto Rico, and the Dominican Republic, is becoming more popular, in spite of the controversy surrounding its lyrics, dance steps and music videos. It has become very popular among populations with a "migrant culture" influence - both Hispanic populations in the U.S., such as southern Florida and New York City, and parts of Latin America where temporary migration to the U.S. is common, such as Guatemala and parts of Mexico. Latin American film is both rich and diverse. The 1950s and 1960s saw a movement towards Third Cinema, led by the Argentine filmmakers Fernando Solanas and Octavio Getino. Mexican movies from the Golden Era in the 1940s are the greatest examples of Latin American cinema, with a huge industry comparable to the Hollywood of those years. Mexican movies were exported and exhibited in all Latin America. More recently movies such as Amores Perros (2000), Y tu mamá también (2001) and Babel (2005) have been successful in creating universal stories about contemporary subjects, and were internationally recognised, as in the prestigious Cannes Film Festival. Mexican directors Alejandro González Iñárritu, Alfonso Cuarón ( Harry Potter and the Prisoner of Azkaban) and screenwriter Guillermo Arriaga are some of the most known present-day film makers. Argentine cinema was a big industry in the first half of the 20th century. After a series of military governments that shackled culture in general, the industry re-emerged after the 1976–1983 military dictatorship to produce the Academy Award winner The Official Story in 1985. The Argentine economic crisis affected the production of films in the late 1990s and early 2000s, but many Argentine movies produced during those years were internationally acclaimed, including Nueve reinas (2000), El abrazo partido (2004) and Roma (2004). In Brazil, the Cinema Novo movement created a particular way of making movies with critical and intellectual screenplays, a clearer photography related to the light of the outdoors in a tropical landscape, and a political message. The modern Brazilian film industry has become more profitable inside the country, and some of its productions have received prizes and recognition in Europe and the United States. Movies like Central do Brasil (1999) and Cidade de Deus (2003) have fans around the world, and its directors have taken part in American and European film projects.